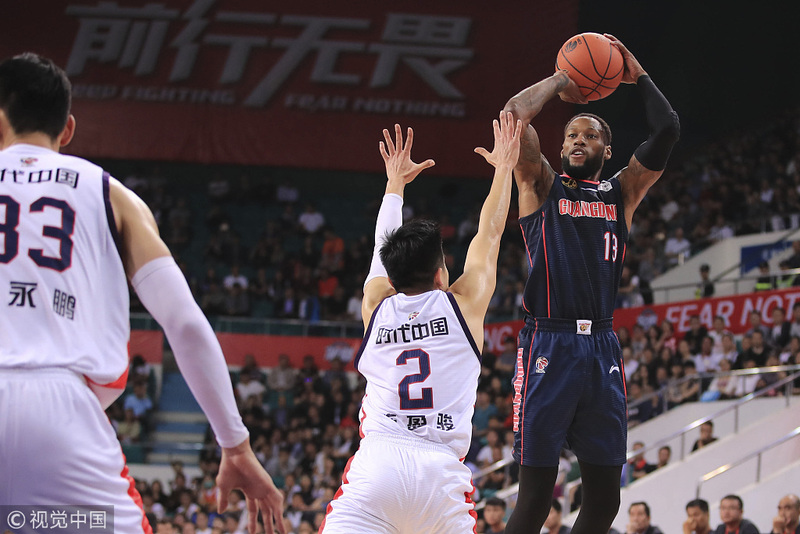 BEIJING -- American Sonny Weems scored game-high 37 points to help Guangdong beat Guangzhou Long Lions 125-110 to get nine-game winning streak in the ninth round of the 2018-2019 Chinese Basketball Association (CBA) league on Thursday. Host Long Lions led the game in the first half with 60-53, and Guangdong reversed the points to 63-60 with a 11-0 attacking at the beginning of the third quarter, Guangdong led the game with 91-85 after the third quarter. Guangdong widened the gap to more than 10 points at the beginning of last quarter, and kept the lead to the end. Zhou Peng got 26 points for Guangdong, and American Malcolm Delaney scored 25 points. American Kyle Fogg got team-high 20 points for Long Lions. With 40-23 in the third quarter, Shanghai defeated Tianjin 123-110. American Jimmer Fredette got game-high 38 points and Argentinean Luis Scola got 30 points and 13 rebounds for Shanghai. Visiting Tianjin led the game in the first quarter of 31-15, and Shanghai didn't catch up with Tianjin after the second quarter, but Shanghai reversed the game quickly in the third quarter and led to the end. Taylor Rochestie got team-high 22 points and Cole Aldrich got 21 points for Tianjin. Elsewhere on Thursday, Tongxi edged Shanxi 98-97, Shenzhen beat Fujian 121-107, and Shandong defeated Jiangsu 100-82.